Hello all and thank you for stopping by today to help celebrate the launch of April My Monthly Hero Kit from Hero Arts (more on that below). My initial reaction when I first got the kit was WHOA! I enjoy waterocloring once in awhile and this kit is a dream come true! 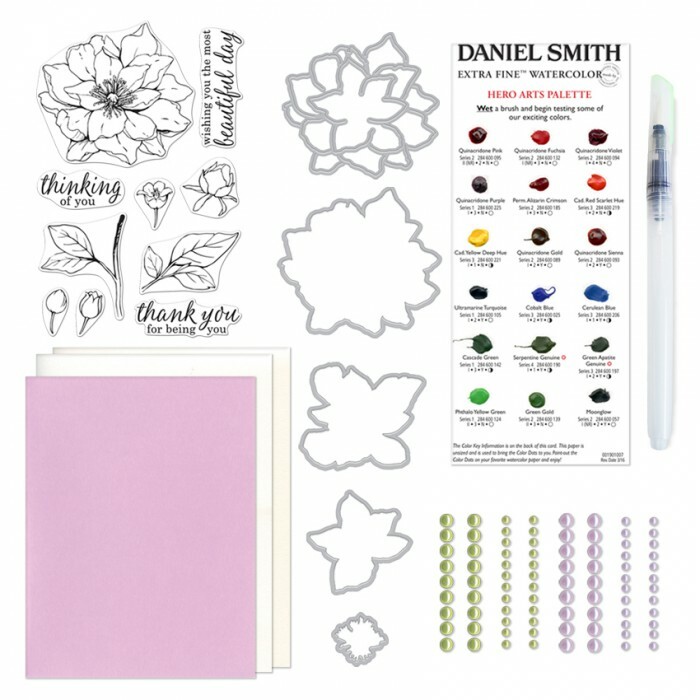 The stamp set included in the kit is fantastic and perfect for coloring, the flower is large enough to be able to easily color and add stunning details. The watercolor sampler set is also fantastic, even thought its a sampler there’s still lots of watercolor to be able to color several images and even make a background or two (I shared one on Hero Arts blog the other day, here’s one more project using this kit). I used Arches Cold Press Watercolor Paper (its the best one in my book so far) and heat embossed the flower and leaves in white embossing powder. My favorite way to watercolor is over wet paper, so I usually like to a lay a layer of clean water over my image and then begin adding color. This way I’m able to get a beautiful transition from a very saturated to almost white. 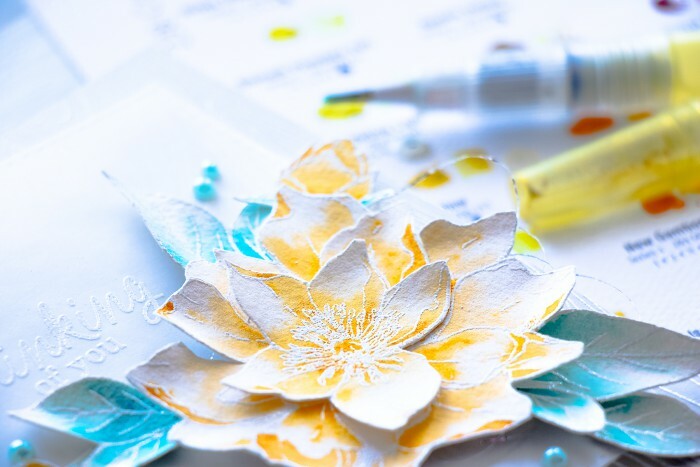 I used my favorite color combination for this card – yellow, teal and white. The flower was colored using Cad. Yellow Deep Hue and a bit of Quinacridone Gold and for the leaves I used Ultramarine Turquoise. To make this flower dimensional I also added some physical dimension by shaping the petals with my fingers. Its easier to shape them while the paper is still wet or at least damp. I used a beautiful Woodgrain background stamp and heat embossed is in white over light gray cardstock for the background of my card. 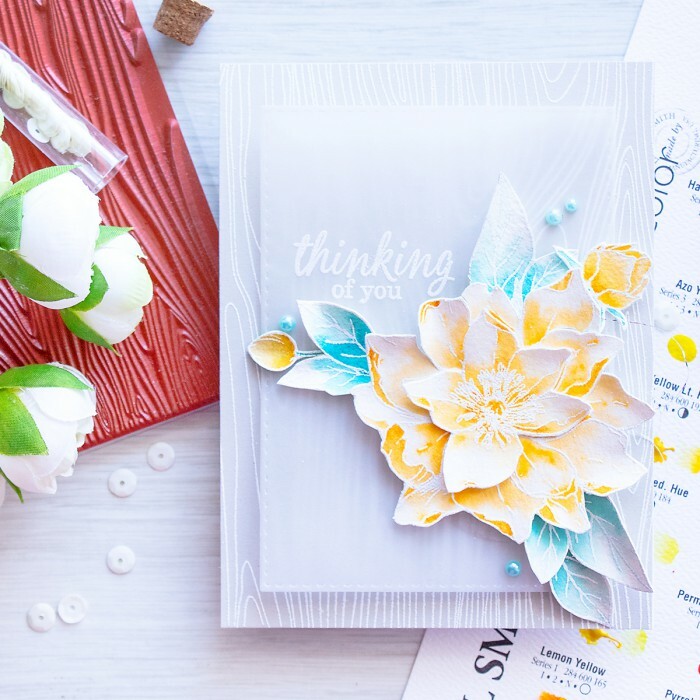 I also added a die cut vellum panel, it serves a double purpose here – mutes a part of the background and helps the flower to stand out and it also houses a white heat embossed Thinking of You sentiment. To complete this project I also added a few pearls in pastel blue. The kit is available for a limited time only – once it’s gone, it’s gone so if love it- better grab it now! If you are into watercolor you are going to love it! I know I do. 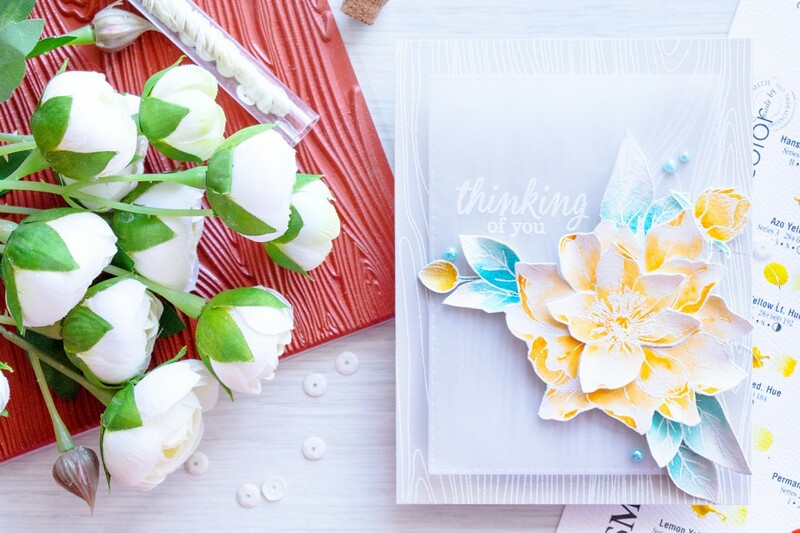 The kit contains: 4×6 clear stamp set; set of four Frame Cuts dies, designed to cut and stack the flower into a layered element (stamp the rose four times to use with these dies); Paper Layering die, which allows you to pop-up a single stamped rose for a different dimensional look; dot sheet of DANIEL SMITH watercolors in a palette specifically selected for Hero Arts (each dot of paint allows watercoloring of 2-3 images, to give you an introduction to these wonderful paints); waterbrush; heavy cardstock in cream and white; notecards and pearls. Want more inspiration? Hop along with us and see lots more creative projects made using this kit. Super stunning! Just received my kit and can’t wait to get started, turquoise leaves, I’m going to try that. I love the way you used the watercolors! Beautiful card! Love how you used the vellum to add a sentiment. Thank you for the inspiration. Lovely card. Absolutely love your woodgrain background on light gray. What a beautiful card! I love the delicate coloring of the flower die cuts. Well done. Love the color combination! 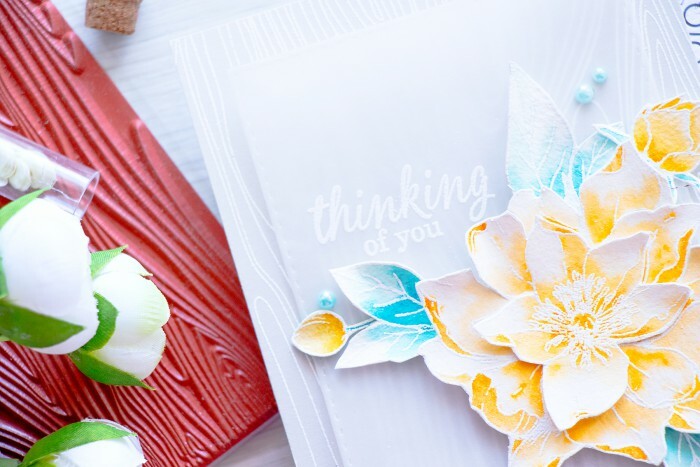 The wood grain covered with velum makes such an elegant card! Pretty. Glad you did the layers. Wow that is a very nice card! Love the colors.